Shortly after the new year it became time for Andrew to start searching for a new a car. He can’t ever make up his mind. It went from E39 M5 to E46 ZHP to probably a Yugo at some point or another. It’s a bit ridiculous. One day a customer came in with a 335i and JB+ upgrade. Customer was gracious enough to let us take it around the block and see what the Juicebox was really all about. Needless to say we were impressed and that day was basically what made up Andrew’s mind. The search began, but in typical Andrew fashion it was pickiest of the picky. The search first started for an E90 335i with a Lemon interior. Lemon interior option is extremely rare and wasn’t really on the option list when ordering. Now on the LCI models the option is known as Oyster. Lemon interior is white seats and leather door inserts with black dash and carpet. Then to top it off it had to be a 6spd. It was like finding a needle in a haystack. To this day Andrew still states that he thinks the E90 body looks more aggressive than the E92 coupe body. One morning searching auctions for other automobiles. A white on red 6spd coupe arrived at the auction lane that morning. Rich brought it to Andrew’s attention and said there are no pictures OR condition report, but it should be in the price range we are looking at. Andrew wasn’t sure about red interiors. Felt it was too much red, but agreed to at least see what happens. So around lunch Andrew pulled up the auction online and watched it come up on the block via the webcam. So here we are looking at this car from the ceiling through a fuzzy camera. Manheim didn’t get the color listing wrong. It’s definitely white…. hmm, maybe a Mtech front bumper? We see black wheels (yuck). The auctioneer starts the bidding spouting out numbers and then finally somebody starts the bid. And hits the button to place his bid, then it hangs. Nobody else bids. Auctioneer doing his damnedest to get somebody else to go. He hits the hammer, SOLD to European Auto Garage. Andrew is excited, but a bit nervous not knowing a thing about the car. Over the weekend we get into contact with a transporter to bring the E92 from Dallas, TX to good ole Knoxville. What felt like one of the longest weeks of Andrew’s life. Transporter tells us the car will be picked up Wednesday and arrive at the shop Friday. Mother nature had other plans. Once again just like a year ago. Nasty thunderstorms rolled through Tennessee with lots of wind, hail and rain. A bit worried about the car, but hoping maybe he is behind the storms. We get a call saying it will now be Saturday and in fact he is behind the storms. A sigh a relief there, but still very anxious to see the car. Saturday morning arrives and we have a Cars and Coffee event that day. We were told it would arrive at end of C&C at 12. Get a call around 11 saying it won’t be till 3. The WAIT was killing Andrew. 3:00 arrives and the truck rounds the corner. There it is on the back of the trailer. And when we say Andrew was beside himself, he truly was. Cloud Nine hit. He yells “Those black wheels….THEY ARE VOLKS!! !” And then he came back to earth very briefly to realize everything else it had. “Are you kidding me!!!! Front AND Rear Brembo GT big brake kit!! !” Quad exhaust system, AC Schnitzer roof spoiler, Vorsteiner trunk spoiler and front lip, Alcantara black headliner, short throw, ZHP knob, RPi front mount intercooler, BMS dual cone intakes (filters missing?). And not to help Andrew’s big flipping head at this point. The trucker fills it with stories about the trip to Knoxville. He stopped at a BMW dealership to drop off a few cars for them. All the sales guys were excited to see the white 335 only to find out it wasn’t theirs. Truckers were on their CBs complimenting how nice it looked. He said the CB chatter was non stop and that the few Porsches he had on the trailer never even got a comment. Car is now off the truck and by this point Rich has already gotten the phone call about it and is racing over to see it. Rich thought Andrew was just so excited that it was just some exaggeration. Rich pulled into the parking lot and came to a dead halt and yelled “ARE YOU KIDDING ME! ?” Rich pops the trunk to find a box and opens it. A set of Macht Schnell catless downpipes. Andrew definitely hit the jackpot. Car immediately got pulled into the shop and up on a lift to see what else was hiding. Turns out it was sitting on some Bilstein PSS9s and had front and rear H&R sway bars. And now able to look at the quad exhaust setup a bit better. It started out as some exhaust and then had a different set of mufflers welded onto it. 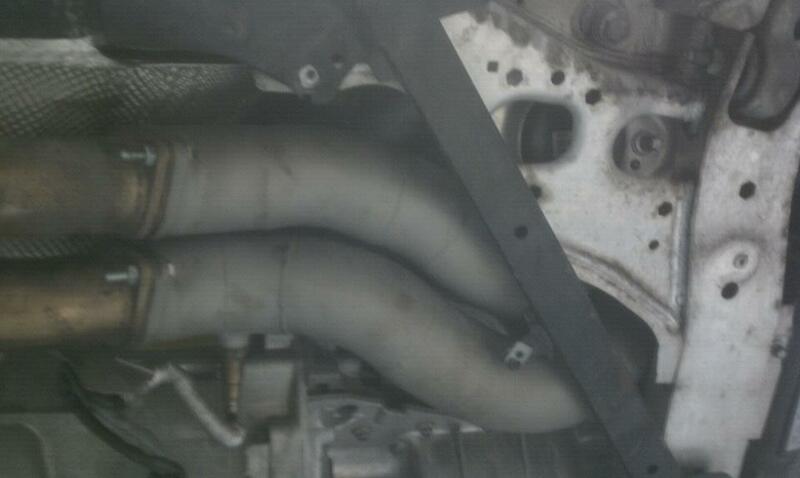 Knowing this car had to have been on E90Post, Andrew did some digging. Turns out it has a Britalman exhaust with custom mufflers. 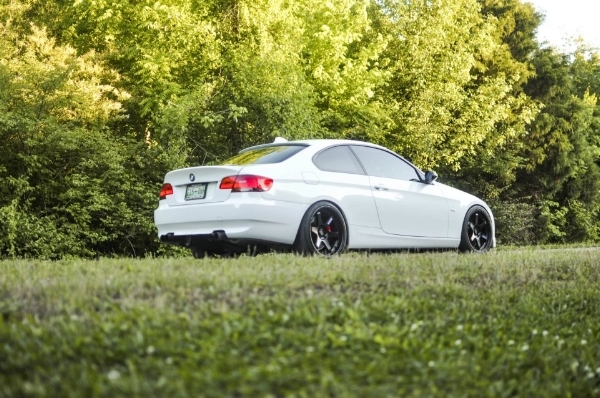 This 335i doesn’t sound like any other 335i we have heard. So first things first were getting some cone filters for the intakes. Ran to the local auto parts store and bought two 3″ K&N cone filters. Once the filters were installed Andrew was able to give the car a good test drive and see if it had a Juicebox or some sort of piggyback on it. Turns out the car was also equipped with a Vishnu Procede as well!! 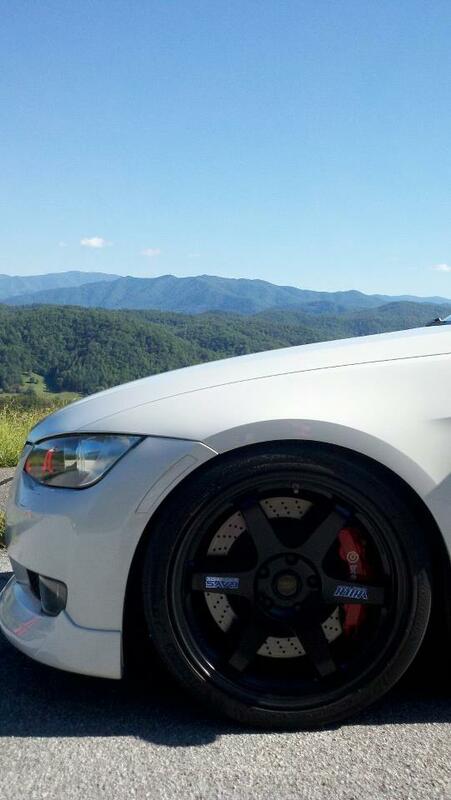 The Volk Racing TE37 in matte black finish are 19×8.5s in front with a 19×10.5 in the rear. So now that the amazing story of how this car was acquired is out of the way lets get to the details. 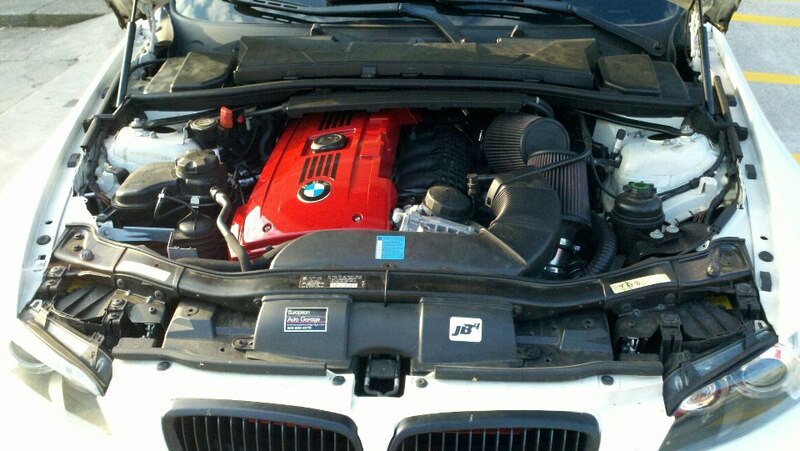 It is a 2007 BMW 335i, Alpine White on Coral Red with a 6spd manual transmission. When car arrived it only had 40,000 miles on the clock and yes it came with all the upgrades mentioned for a STEAL. Now some stuff needed to be addressed. The clutch was toast. It was slipping. An angel eye bulb was out. Left rear tail light LED strip was done. The car kept setting Vanos faults just cruising down the highway. So we here immediately put the wheels in motion. A clutch was ordered up. Just a factory one for now. When we pulled out the old one it was toast, but the flywheel had some interesting wear on it. Andrew ordered a set of Arc White angel eye bulbs from BMS as well as a JB4. The brake pads were gone. So Andrew ordered up some Carbotechs. The Vanos solenoids came out and were cleaned and reinstalled. The vanos faults would still come back during normal cruising and would send the car into limp mode. We decided to first bring the entire car up to date coding wise. Andrew forgot to turn the Vishnu off and it coded right onto the Vishnu (whoops). Andrew was a bit annoyed by that because with a JB4 if it is turned on the Autologic can not read the car. It’s interesting the more expensive piggyback doesn’t have this feature, but yet has VIN locking? So JB4 was installed into the car and the coding was redone and brought up to date. Vanos faults and boost pressure fault have not come back since. No telling if the Vishnu was truly at fault, but do have to wonder. The car is still on its original high pressure fuel pump and injectors. Hopefully it’ll stay that way (but highly unlikely). One thing we did address with coding is the wastegate rattle. It was obnoxious on the car and still is on start up. But before the coding on deceleration you could hear them rattle. Between 7/06-7/08 BMW released a firmware update to help with the rattle. It has made a tremendous difference with the rattle on deceleration. No notice in decrease in performance or anything either. BMS has been working on new firmware for the JB4 to make a more dedicated E85 map. Andrew has been testing these new firmware updates. On 93 alone the new updates are very very impressive. With a 50/50 mix of E85 its bonkers. An easy 17PSI is hit and literally just pulls like a train. The car has not been dynoed yet, but cars with similar upgrades and 50/50 mix are in the neighborhood of 410whp/440wtq. So you maybe wondering the car has basically everything what does the future hold for this car? Well the curb rash has got to be fixed on the Volks and will get re-powder coated matte black with new updated Red Volk stickers. At first he wasn’t a huge fan of the Volks on a BMW. But it blends his passion for Japanese cars as well as his passion for BMW. A BMS Methanol kit will be added for more POWAHHHH, as Jeremy Clarkson would say. You can never have enough power. More coding tricks up the sleeve just to add some unique touches to the car. But the most radical upgrade for the future will happen once the car is paid off. The stock quarter panels will come out for some M3 quarter panels to fit those 10.5 wide wheels correctly. And will also get a Mtech rear bumper with diffuser. Andrew isn’t very keen on the Vorsteiner front lip as well. M Aero lip is planned to make the front end a bit more aggressive looking and more flowing. Alcantara shifter boot along with E-Brake boot to match the rest of the alcantara interior. And plans for a M3 instrument cluster to go in as well to spice the interior up a bit more. The day Andrew bought this 335i he probably should have bought a lottery ticket or played some poker in Vegas. Just extreme luck. Stay tuned for more developments on this car and see whose ego will wind up biggest in the shop. 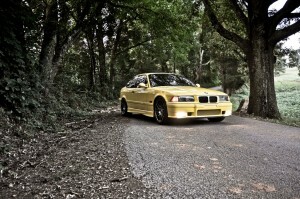 Back in late October of 2010 we came across this ’95 Dakar Yellow M3 on eBay. It looked great. A one owner car owned by a ///M Enthusiasts who also had tucked in his garage a Dakar Yellow M Roadster. The car had a reserve on it. We placed a low bid thinking it would just bump the price up and not meet reserve. Well….. we were wrong. November 7th, 2010 the car made it to Knoxville from Florida. And so the project began. The car is a 1995 BMW M3 in Dakar Yellow with black leather. When purchased car had 182,000 miles on it. The car has been resprayed at some point in its life. When we got it the original owner had just put a brand new factory headliner in it. Upon test driving the car we immediately knew it was gonna need a driveshaft. And the tire roar was ear bleeding loud. Once we got it to the shop we looked it completely over. All four wheels were bent. The trans fill plug was loose and leaking a bit. Being a Florida car and seeing the Florida sun, the moldings and seals were completely dry rotted. Immediately the headliner came out of the car and sold for one not in good shape. We immediately sent it off to have it recovered in alcantara along with the rear deck. At the same time we removed the black plastic moldings around the car. We feel the black plastic cheapens the look of the car. Lots of E36 M3 guys disagree with this. But for us personally we will never understand it. We sent them off to our good friends Wade’s Body Shop in Oliver Springs, TN to have them match body color. The paint that was used is a new product that was shown at SEMA last year which sticks to the plastic. They came out great. When these were completed we added BMW Lightweight side molding emblems. Next step was to get this car having a proper stance. We ordered up some H&R Sport springs. H&R is a fantastic company and the sport springs they offer are progressive. Offering a lowered look and still giving us a factory type ride, but with improved performance through the twisties. The car was coming together. After the drop we ordered up some VMR VB3 (CSL reps) in Hyper Black. We picked 18×8.5 size all the way around to be able to rotate tires. The VMRs got wrapped in BFGoodrich tires in 235/40/18. While the car was up in the air we went ahead and made our own “test pipe” by cutting off the resonators and welding in straight pipe and painting it black. We found a great supplier who had all sorts of Euro stuff for the car. We ordered a 3-spoke steering wheel wrapped in alcantara with ///M tricolor stitching. ZKW headlamps, equal length headers, and a gauge cluster. When we installed the driveshaft we figured it was a good time to upgrade the clutch. We installed a UUC clutch and lightened flywheel along with a factory Z3 M Roadster shifter for shorter throws but retaining a factory feel. 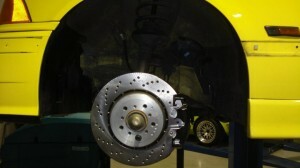 While doing a ZCP (E46 Competition PKG) brake upgrade on a customers E46 M3. We decided to mock the brakes up on our car. The fronts fit perfect. The rears on the other hand need some fab work. Tara’s husband Steve lent us a hand and custom fabbed some brackets for us to make the Competition Package brakes to work on our E36. While we haven’t installed them yet on the car below are some teaser pics of the front brakes mocked up along with our custom bracket during the measuring process. A common problem on E36s is the door panels tend to come apart which ours were. Brand new door panels are quite pricey. We found a company that redoes the door panels along with custom touches for extra. We went the extra mile and did alcantara inserts with ///M tricolor stitching on the handles. They look fantastic and complete the theme we have going on in the interior. The factory rear differential came out of the car. And in went a 3.38 limited slip with new 3 clutch pack setup for 40% lock. Factory final drive was a 3.15. This upgrade alone has awoken the car up a considerable amount. We want this car to stay true to its roots, but upgrading areas that BMW could have possibly done a bit better. Being that this is a 95. The factory kidney grilles remain along with the body color mesh grille in the bumper. Stay tuned for more when more upgrades come in. Till then enjoy some of the pictures below.